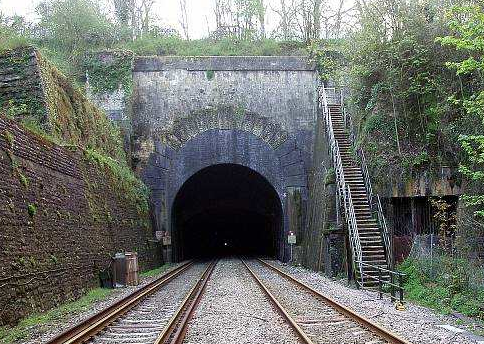 More than 40 historic structures that were part of Isambard Kingdom Brunel's original Great Western Railway have been given protected status. The Department for Culture, Media and Sport has listed 35 bridges, tunnels, viaducts and station buildings to ensure their preservation. Seven structures already listed along the line dubbed 'God's wonderful railway' have been upgraded to a higher status. Stretching from London Paddington to Temple Meads in Bristol, construction on the route began in 1836 to Brunel's engineering's designs. Among the structures protected is The Box tunnel in Wiltshire, which has been handed Grade II status. It was one of the most extensive and famous of the pioneering Great Western Tunnels. According to legend, aligned by Brunel so the rising sun would shine through it every year on April 9, his birthday. In the 20th century the tunnel was linked by secret lines and tunnels to a complex of military stores and shelters buried into a hill. Swindon's Roman Road Bridge – which has an unusual rounded arch design thought to be a conscious reference to antiquity by Brunel – has received the same status. Road bridges at Dauntsey and Hunts Mill and the bridge near Swindon Road, part of a cluster dating from between 1839 and 1940, are being listed at Grade II as are the River Avon Viaduct, from the 1840s, and the entrance portals of the Chipping Sodbury tunnel and its six ventilator shafts. Brunel's Maidenhead bridge, which is believed to have the longest and flattest brick arches ever built, is being upgraded to the highest Grade I listing, an honour shared by only five per cent of listed buildings. The modest footbridge at Sydney Gardens in Bath, recently identified as the last of Brunel's cast-iron bridges on the railway, is upgraded to Grade II*, along with the tunnel portals at St Anne's in Bristol and the Twerton Wood near Bath. Emily Gee, head of listing at English Heritage, said: 'It is just such a masterpiece by the mighty Isambard Kingdom Brunel, a railway project of international importance.